From Mount Tabor we made our way to Nazareth to visit the homes of Mary and of Joseph. In the first century, Nazareth was a tiny village of just 25 caves (not houses), which suggests Nathaniel’s question to be a reasonable one: “Can anything good came out of Nazareth” (John 1:46)? Though Nazareth had perhaps 250 inhabitants 2,000 years ago, today it is home to some 90,000 people, 38% of whom are Christian – the highest percentage in all of Israel. As we entered the Church of the Annunciation built above the cave-home where the Archangel Gabriel said to Mary, “Behold, you will conceive in your womb and bear a son, and you shall name him Jesus,” we heard the local Catholics singing the Lord’s Prayer in Arabic, a clear witness to the universality of the Church (Luke 1:30). The word was made flesh here. Tears welled up in my eyes as I walked through the church towards the grotto, so palpable was the sense of the holy in this place, so great was the reality of God's love for us. It was a powerful moment that I cannot adequately express with words, nor one that I will ever forget. After spending a few moments in prayer at the grotto, we went to the upper church to look around and to see the local Christians as they celebrated Sunday Mass. I was shocked to see so many men and young people present and wished that we would see the same in the United States of America. It isn't very far at all, and it was in Joseph's cave that the Holy Family lived for thirty years. It was a special grace to be at the home of the Holy Family as we celebrated the Feast of the Holy Family. As I thought about the Christians who remain in the Holy Land despite the difficult conditions under which they live, I asked myself why they stayed. Remembering what I felt at the grotto, I knew very well why they remain: Here they feel clearly the presence of God and here they maintain the memory that in this very place the Word of God began man. 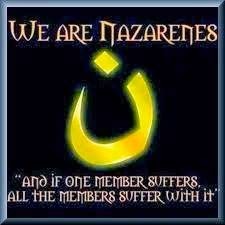 Remember to pray for the Christians of the Holy Land today, and every day. This morning we left the city of Tiberias on the Sea of Galilee (in the north of Israel) and made our way to Mount Tabor where Jesus was transfigured and his glory was revealed to Peter, James, and John before he began his journey to Jerusalem (158 kilometers to the south) to give his life for us. On the way to Mount Tabor, we drove past the site of the Battle of the Horns of Hattin. It was here that the army of Saladin defeated the Crusader army on July 4, 1187, thus ending the Kingdom of Jerusalem. With that defeat, the Holy Land was again under Muslim control. The other priest and I were quickly whisked away to the sacristy to prepare for the celebration of the Holy Mass, the texts of which were taken from the Feast of the Transfiguration. Each of the Masses we will celebrate in the Holy Land will be site specific, as is often the case with pilgrimage destinations. There was a bit of a paradox offering the Holy Mass on Mount Tabor. When he was transfigured on this mountain, the glory of Jesus was apparent to the Apostles, which is why they “fell silent and did not at that time tell anyone what they had seen” (Luke 9:36). In the Eucharist, his glory remains hidden under the appearances of bread of wine, though it is revealed to those who believe. Mount Tabor is also where the Risen Lord gave the Great Commission to the Apostles before his ascension to the right hand of the Father (see Matthew 28:16). The connection between his glory and the proclamation of the Gospel should be evident to all. Unless we have known his glory, we cannot be adequate heralds of his good news. This is why a sharing in the sacramental life of the Church is so very important. Within these signs, his glory is revealed and we are sent. Greetings from the Holy Land! After Mass with Father Dan Good. So Peter and the other disciple went out and came to the tomb. They both ran, but the other disciple ran faster than Peter and arrived at the tomb first; he bent down and saw the burial cloths there, but did not go in. When Simon Peter arrived after him, he went into the tomb and saw the burial cloths there, and the cloth that had covered his head, not with the burial cloths but rolled up in a separate place. Then the other disciple also went in, the one who had arrived at the tomb first, and he saw and believed (John 20:3-8). As I’ve mentioned several times before, this “cloth that had covered his head” is the Veil of Manoppello, the Holy Face. Very soon, I will stand in that very tomb and offer the Holy Mass on the very stone on which the body of Our Lord was placed and will seek to experience the wonder of those two Apostles. I have come now to the Holy Land to fulfill one of my duties as a Knight of the Holy Sepulchre to support the Christians of the land where the Lord himself walked. I have also come on pilgrimage to visit the places made holy by the Lord, to follow in his footsteps, and to grow in faith, hope, and love. My guide for the next several days will be Steve Ray, the Catholic convert whom you have likely read in apologetic works, heard on Catholic Answers Live, or seen on EWTN. There are, I think, 25 pilgrims travelling with Steve on his Footprints of God pilgrimage. I am very excited to see Steve’s enthusiasm and to learn from him as he expounds the Scriptures for us in the very places where so much of Biblical history occurred. Since I was already in Rome, it was decided that it would be best if I would simply would meet the group in Tel Aviv, but since my flight was scheduled to arrive 30 minutes after everyone else there was some question as to whether I would have to have then make my own way to Tiberias rather than holding up the rest of the group. You can imagine my concern then when my flight out of Rome left 45 minutes behind schedule. Somehow, though, my flight still managed to arrive 5 minutes ahead of the original schedule and I cleared customs before anyone else on the pilgrimage. Today we simply drove from Tel Aviv to Tiberias, where we had dinner and then celebrated Mass. Most of the pilgrims have already gone to bed and I will do so shortly. I'll be blogging my pilgrimage as much as possible (the Wi-Fi at the hotel seems a bit spotty). The other pilgrims have made a very long flight from New York; I, on the other hand, made a rather short flight of about 2 1/2 hours from Rome and only went forward one time zone. Consequently, I think I may be the only functioning pilgrim tomorrow. Happy anniversary, Springfield in Illinois!